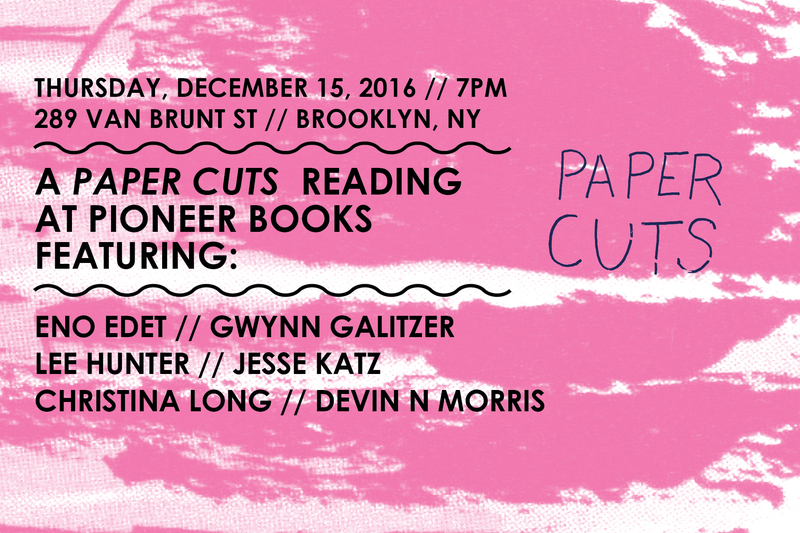 A Paper Cuts reading at Pioneer Books (289 Van Brunt St) featuring Christina Long, Eno Edet, Devin N Morris, Gwynn Galitzer, Jesse Katz, and Lee Hunter. Born in Chicago and raised in Metro Detroit, Christina Long received her MFA in Printmaking from the School of the Art Institute of Chicago in 2012 and is also a violinist for NYC’s New Amsterdam Symphony Orchestra. Being heavily involved in the Metal community for over a decade, she cares about promoting the many women of color who love heavy music genres. #BLKGRLSWURLD is a quarterly zine run by Christina Long and her younger brother and sister since 2013. As a trio of artists and writers they are known as Trifecta Studios. Being young African American metalheads sharing their love of the Metalcore music scene, they share footage from live shows and host open calls for art and prose. The zine is free to download online. Raised and nurtured by New York’s underground, Eno Edet has taken the lessons and teachings of the city’s most sacred weirdos, and has translated them into his own brand of children stories. These stories are written with the intent to spread love, happiness and imagination throughout the world. But in a very strange way. Devin N Morris is a mixed media artist and writer whose practice includes photography, collage assemblage and video marionette performance. His work is rooted in memory and mental dialogue, interrogating how memory subconsciously roots itself in the the contemporary proliferation of black identity. In studying fashion-based imagery, he became increasingly aware of the lack of black representation within commercial environments. Placing the photograph at the center of his practice, he looks to rebuke that occurrence by representing black queer men and women within his imagery and arrangements. Devin is also the editor of the great collaborative effort 3 Dot Zine, which is an annual publication that serves as a forum for invited artists to center and elaborate on marginalized concerns and celebrates the futurity of minorities. He has exhibited in America and Brazil, with short stories and visual works also appearing in NYU’s ISO Magazine, Nii Journal (London), Picture Newspaper and Packet Bi-Weekly Zine amongst others. Lee Hunter is an multi-disciplinary artist working with photography, sculpture, and video. Her practice combines personal experience and research to ask questions about the construction of space and the varieties of perception. Her work has been exhibited in national and international galleries and artist run spaces. She has received support to attend artist in residence programs at The Vermont Studio Center, I-Park Foundation, and The Luminary. Hunter received her BS from Portland State University and her MFA from the San Francisco Art Institute. Hunter lives and works in Brooklyn, NY. A Paper Cuts Reading at Pioneer Books.